New dental imaging technology called 3D cone beam scans produce high-quality 3D images of teeth, teeth roots, jaws and even the skull. These 3D images allow us to identify potential problems that oftentimes go unnoticed with traditional dental images. In our office, we have the Sirona Orthophos XG 3D. It can capture our patients' whole jaw in a single span. The field of view is large enough to avoid the stitching of several 3D x-ray images and thus multiple exposure to radiation. Yet is is also small enough to be a time-saver in diagnosis. One of the reasons why patients love Orthophos XG 3D is because 3-D imaging capability translates into more precise, more natural-looking dental restorations. While traditional 2-D imaging is limited in its scope, with Orthophos XG 3D we can measure things like bone density, which is essential for placing dental implants. To determine whether you're a good candidate for dental implants, one of the primary things we must evaluate is the thickness and quality of your jaw bone. This is important because dental implants are permanently attached to your jaw, and it's essential that your jaw is dense enough -- and healthy enough -- for implants to be possible and successful. With 3D scans, we can also gauge the thickness of your bone structure to determine what size dental implants are appropriate for your mouth. In essence, the more information we have about your mouth, the better your dental implants will look and feel! 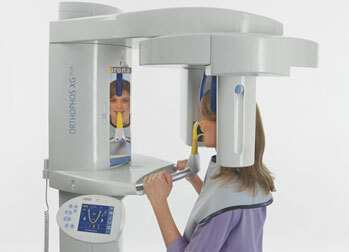 We love the Orthophos XG 3D because it helps us make a diagnosis quickly, easily and accurately. Simply put, 3D scans capture much more data than traditional X-rays. This gives us an in-depth picture of your jaw, mouth and teeth. We can use this information to determine whether certain problems such as cavities, abnormal growths, sinus problems, sleep apnea or nerve damage exist -- conditions that aren't evident from a traditional 2-D image.